One of my best friends is a nephew of Paul Gillespie, catcher for the 1942-45 Chicago Cubs. Though he had a short career due to war service and then injury in the ’45 Series, Gillespie has his own special place in baseball history as one of just 2 players to hit home runs in their first AND last career at bats. I included an illustrated story on Paul Gillespie in my book, The League of Outsider Baseball, which made his extended family very happy to see their relative in print. I’ve kept in touch with several members of his family over the years and was honored when I was included in the family’s order of exact remakes of Paul Gillespie’s signature model bat. For those who don’t know, Louisville Slugger will reproduce the bats of past players who have had a signature model with them. The reorder has to come from the player himself or a direct relative, in this case it was Paul’s sister. This beauty just arrived this afternoon. 35″ G62 model bat as ordered by Gillespie in his August 4, 1945 contract with Hillerich & Bradsby. I know it’s not an original gamer, but it’s as close as I’ll get and means all the more because it came from his family. Here’s a copy of his original bat order from 1945. On August 4, the Cubbies were in Cincinnati playing the Reds when Paul was approached by reps from Hillerich & Bradsby. 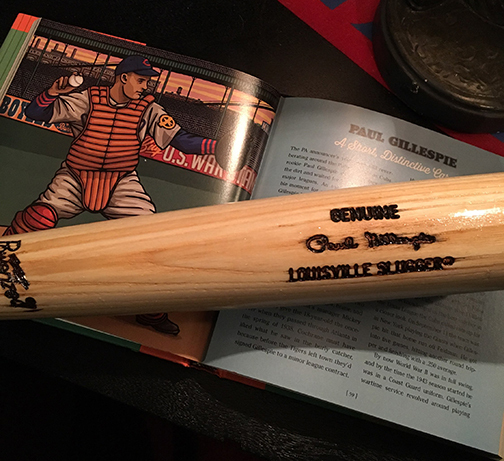 For the princely sum of $1, Paul Gillespie lent his endorsement to their bats and received his very own signature model Louisville Slugger. 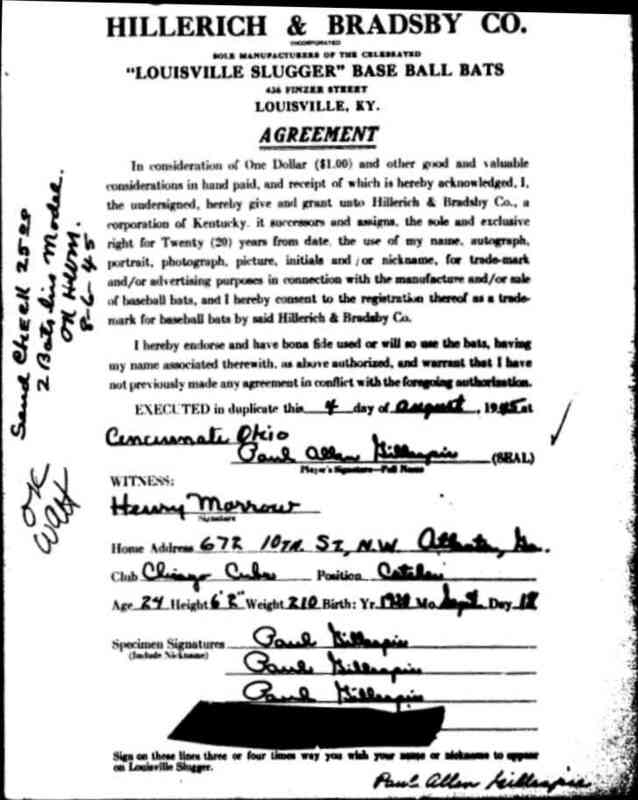 The contract is interesting because he signs his name several times and one of these were used to make the signature stamp used on the barrel of his bats. The P.A. announcers’ voice was still reverberating around the Polo Grounds as Cubs rookie Paul Gillespie dug his spikes into the dirt and waited for his first pitch in the major leagues. An exciting and memorable moment for any big leaguer, but when Gillespie knocked a Harry Feldman fastball into the bleachers for a home run that September 11, 1942 afternoon, he joined an elite group of players who hit a homer in their first major league at bat. It was one of several noteworthy moments in Gillespie’s short, distinctive career. Paul Gillespie received his break in professional ball through his friendship with Rudy York of the Detroit Tigers. The two both called Cartersville, Georgia home and York convinced Detroit’s manager Mickey Cochrane to give the 18 year-old the once over when they passed through Atlanta in the spring of 1938. Cochrane must have liked what he saw in the burly catcher because before the Tigers left town they’d signed Gillespie to a minor league contract. His first assignment was with the Lake Charles Skippers of the Evangeline league, the bottom rung of the minor leagues. Gillespie hit a credible .312 in 129 games but due to some contract shenanigans he was released from the Tigers organization by Baseball Commissioner Landis and declared a free agent. The Brooklyn Dodgers quickly snatched up the catcher and he began a three year stretch which saw him play for no less than 8 different teams. By the summer of 1942 he was with the Tulsa Oilers, a Chicago Cubs affiliate. When Gillespie was acknowledged as the best catcher in the Texas League the Cubs called him up for a closer look. On September 11th the team was in New York playing the Giants when Gillespie hit that home run off Feldman. He got into 5 games, hitting another round tripper and finished with a .250 average. By now World War II was in full swing and by the time the ‘43 season started he was in a Coast Guard uniform. Gillespie’s wartime service revolved around playing baseball and he kept in big league condition by being teamed with former Cardinals pitcher Al Jurisich. The two led their Louisiana based Coast Guard team to the U.S.O. championship. In the late summer of ‘44 Gillespie was given an honorable discharge from the Coast Guard. That the war was still in full-swing suggests that he was let go for medical reasons, not uncommon with professional athletes, most of whom had at one time or another suffered injuries that made them poor recruits for active service. 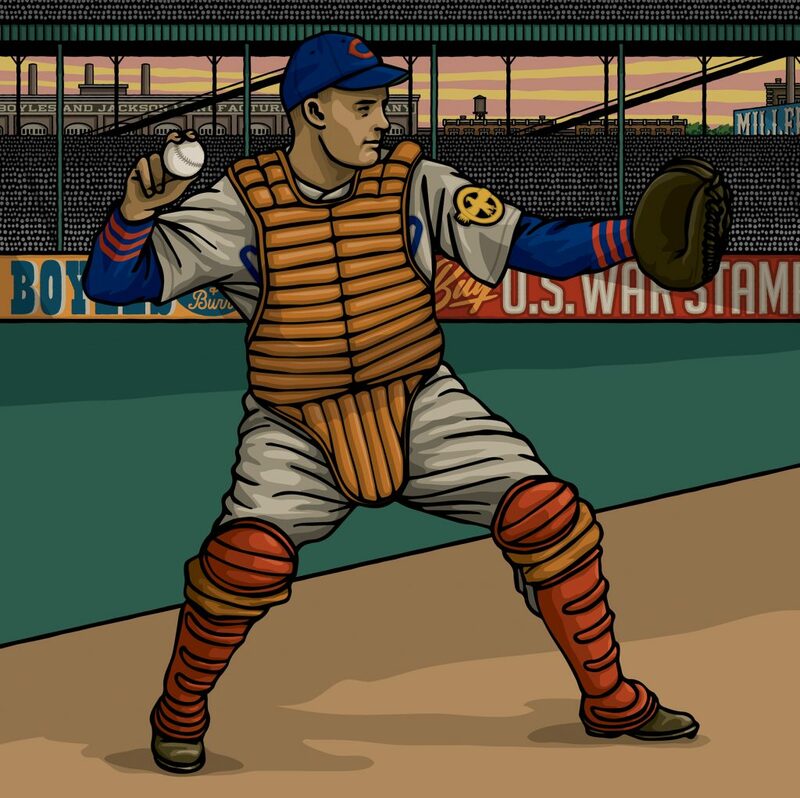 On September 21st, Gillespie’s first game back with the Cubs, he again found himself facing the Giants at the Polo Grounds. With one on in the first, the big catcher hit a two run homer, again making a great first impression at the Giants’ expense. He got into 5 games before the season ended and was deemed a sure-bet regular for the ‘45 season. When the 1945 season began, Paul Gillespie and three of his Cubs teammates were at the front and center of a minor baseball controversy. Gillespie was one of four Cubs who wore a gold and blue eagle (military uniform buffs call it the “ruptured duck” patch) on their left sleeve signifying an honorable discharge from the armed forces. Men discharged from the military wore this eagle patch on the uniforms or as a lapel pin to distinguish themselves from men who for what ever reason did not serve in the military. In the civilian world this was no cause for concern, but when it came to baseball, league officials balked. Since the beginning of the war, many fans cried foul when big, healthy ballplayers continued to appear in the big leagues while every other able bodied male in the country was drafted. Major League Baseball had been very self-conscience about their players appearing to get special draft exemptions and now here was a patch that would make it easy to distinguish at a glance which players served and which ones did not. An early form of political correctness prevailed and the patch was retired sometime during the summer. By that last year of the war, organized baseball had been thoroughly drained of its best talent. The Cubs emerged as the front-runners of a dramatically weakened National League but still had to contend with the defending World Champion St. Louis Cardinals. It was during the late summer pennant stretch that the big Georgian emerged as the team’s best fielding catcher and clutch hitter. Though not a power hitter, Gillespie put on a show for the ages on August 15, 1945 when he hit two home runs at Brooklyn’s Ebbets Field, one of which was a grand slam. The two blasts counted for 6 of the Cubs 20 runs that afternoon. The Cubs had already clinched the pennant when they faced the Pirates at Forbes Field on September 29th. In the 4th inning Gillespie stepped to the plate to face Rip Sewell. With one on, the catcher knocked one into the stands for a home run. The homer brought his season batting average to .288 and the season ended the following afternoon. As he jogged around the bases, Paul Gillespie had no way to know that it was the last hit of his major league career. The Cubs faced the Tigers in the World Series and Gillespie was the team’s first line back stop. As every Cubs fan knows, the ‘45 series ended in a Cubs defeat and the same can be said for Gillespie’s major league career. In the ninth inning of Game 2, Gillespie was running out a single when he tripped, aggravating an old knee injury. Gillespie was a gamer, however and he was back behind the plate in Game 5. This proved to be his last appearance though, as he further damaged the knee swinging at a Virgil Trucks curve ball. During the winter the Cubs sent him a new contract with a raise in salary and in January 1946 he married Louisiana native Pat Ozment. He underwent surgery to fix his knee injury and looked forward to being the Cubs starting catcher in 1946. But it was not destined to be. The operation was unsuccessful and after a disappointing spring training the Cubs released him to the minor leagues. Though Paul Gillespie’s major league career lasted less than three summers it was none the less one of some distinction. To this day only one other man in the entire history of Major League Baseball was hit a home run in their first and last big league at bat. Gillespie was the first and Paul Miller did it in 1965 and 1969.